Betway betgames offer wheel-of-fortune-style games with a unique and extensive variety of betting options. Each of our betgames has a unique take on classic games like the wheel and dice. To get started, simply log into your account (or register a new account), click the Betgames tab, select your preferred betgames and enjoy. A detailed breakdown of how to play betgames is available in the “How to play?” tab of each game. Before you get started ensure that you have a positive account balance. 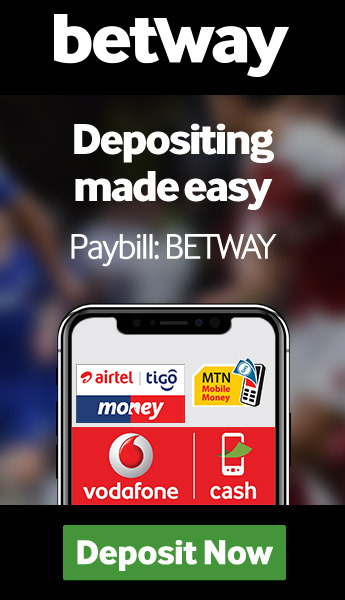 If you’re new to Betway, you can make your first deposit and claim your Welcome Bonus. If you’re having touble, take a look at our FAQs for help with making your first deposit. If you require any addition assistance, do not hesitate to contact us. The classic Lucky betgame is split into three variants: Lucky 5, Lucky 6, and Lucky 7. The numbers following “Lucky” denote the numbers of number balls draw in each particular game. For example in Lucky 7, seven numbered balls. Numbers – predict which numbers will be drawn. Numbers betting options range from predicting a single ball that will be drawn to predicting every ball that will be drawn. If you correctly predict five of the seven numbers (only in Lucky 7), you will win 1,750 times your original bet. Black/Yellow Balls Total – predict the combined total of the numbers drawn on a particular type of ball. For example if the 32, 15 and 7 yellow balls are drawn, the total for the combined yellow balls would be 54. If you predicted that the yellow-ball total would be within 50 less of 73.5, you would win. Total Sum – predict the combined total of all the numbers drawn. Black/Yellow – predict particular events as they relate to the colour of the balls drawn. For the example, predict that the first ball drawn will be yellow or black or if they will be more yellow balls drawn than black. New Lucky 5, 6 and 7 draws occur every three minutes. 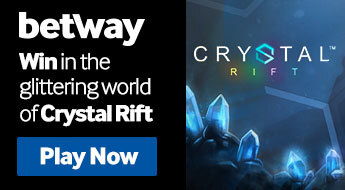 Betway betgames offer two dice game variants. The first, Dice Duel is a simple game that has the host roll two dice, one blue and one red. Players are required to predict which die will have the highest face value or if they two dice will have the same face value. The second variant is Dice and features the host rolling a set of five red dice. This dice-game variant offers a wide range of betting options. Combinations – predict which predefined set of combinations will appear following a roll. Combination bets on offer include predicting that there will be at least one pair of the same face value or if all face values will be different. Total Sum – predict whether the combined total of each of the five face values will be more or less than a predefined total. For example betting that the combined total value will be less than 17.5. Odd/Even – predict the distribution of odd and even numbered face values of a roll. For example, predict whether there will be more dice with odd face values than even. New Dice Duel and Dice rolls occur every three minutes. The Wheel betgame features a classic spinning jackpot wheel with numbered grey, red and black squares from 1 to 18. Once the game begins, a host will spin the wheel and once the wheel stops, bets will be settled automatically. Bets can be placed on a variety of outcomes with a wide range of odds. New Wheel spins occur every three minutes. In addition to our range of Betway betgames exclusives, Betway also offers a number of classic casino table games that have been adapted into betgames. Baccarat – as in classic baccarat, you are required to predict which hand total (the Player’s or the Banker’s) will be closest or equal to 9. In the betgames variant, you have additional betting options that include the chance to bet on Colour, Suit, Total and Even/Odd outcomes. Bet on Poker – utalising the Texas hold 'em poker variant, a total of six two-card hands are drawn. You are then given the chance to place bets on which hand you think will win at four different points in the game: before the cards are dealt, once the hands have been dealt, after the flop, and finally after the turn before the river is dealt. A 40-second period is given at each stage to place bets. War of Bets – one of the most basic casino games, War of Bets simply requires you to predict which of two cards drawn will have a high value. In the Betway betgames variant, you also have the chance to bet on Colour, Suit and Value betting options. Casino classic betgames feature live ongoing draws that occur one after another 24 hours a day.